I love limited edition palettes/compacts because they usually are packed with product and a great way to try more expensive brands for a fraction of what you would normally pay if you purchased the items separately. 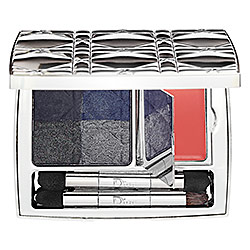 Dior's Blue-Tie compact is a beautiful metal-embossed (silver colored) case that comes with 4 shadows in shades of blue and silver as well as a peachy-pink lip gloss. This is not inexpensive at $70, but hey, Christmas is not about getting socks and things that you "need". It's for getting shiny objects that make you happy, in turn making others happy that you are so happy.